A Life on Venus: Sit up straight! My body just ain't what it used to be. But why would it be? I am not 20 any more. Hell, I am not even 30 any more. This body has gotten me around for a while now and produced two babies, thank you very much! Times have changed and so has this bod of mine. As I slip down the slope to 40, yelling for the rest of the family to hold on, my body creaks and cracks. It aches and pains. It swells and inflames. All leading to massive headaches that have me curled up in the foetal position. A particularly bad migraine a week or so ago was the catalyst to get ACTION and do something about this old body of mine. Action means that I am now seeing a physiotherapist. Three words: SIT UP STRAIGHT. Well, of course there were a lot more words than that but the general idea is that after years of sitting at the computer looking like the hunchback of Notre Dame, my back, neck and shoulders are out of whack (the technical term that my new physiotherapist, Ellie, used). Apparently my head doesn't even naturally look straight any more, preferring to look slightly to the left. There are more issues in the mixing pot of my aches and pains, like pelvic issues during pregnancy and scoliosis. But we are starting at the top, as this is the most likely cause of the migraines and working our way down. I left my appointment taped up (with hot pink tape) like an elite athlete in an attempt to pin my shoulders back and hold my head up straight. The guys at work think that I have been playing rugby in my spare time - because that is extremely likely. Upon arriving home I had to explain it all to my extremely inquisitive daughter, who now yells at me through the house, "SIT UP STRAIGHT MUM!". Thanks Babe. 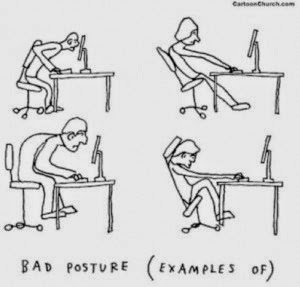 So as I sit here tapping away at this blog post about my whacky back I am reminded to SIT UP STRAIGHT! And by the way, sitting up straight actually really hurts right now. And when I tell my own mum about all this she will be mortified at having spent money on 19 years of ballet tuition and wonder why I don't have the perfect posture! Do you sit up straight? or are you a huncher? Had any experiences with physios? good, bad?